1. Put the potatoes in a pan of water and bring to the boil. Cook for 15 minutes until tender. Drain, crush lightly, then stir in the pesto and 1 tbsp olive oil. 2. Meanwhile, heat the remaining oil in a large pan over a medium-high heat. Cook the chicken for 5 minutes, turning, until golden; transfer to a plate. Add the onion, garlic and red pepper to the pan and fry for 3 - 5 minutes to soften. 3. 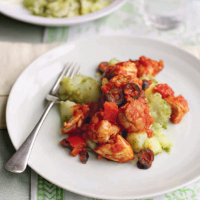 Return the chicken with any juices to the pan and add the passata and olives. Bring to the boil, turn down to a simmer, and cook, covered, for 10 minutes or until the chicken is cooked through. Stir in the sugar, season and serve with the pesto potatoes.